What could be better than stepping out of your hotel and starting right into a day of pure winter sports fun? 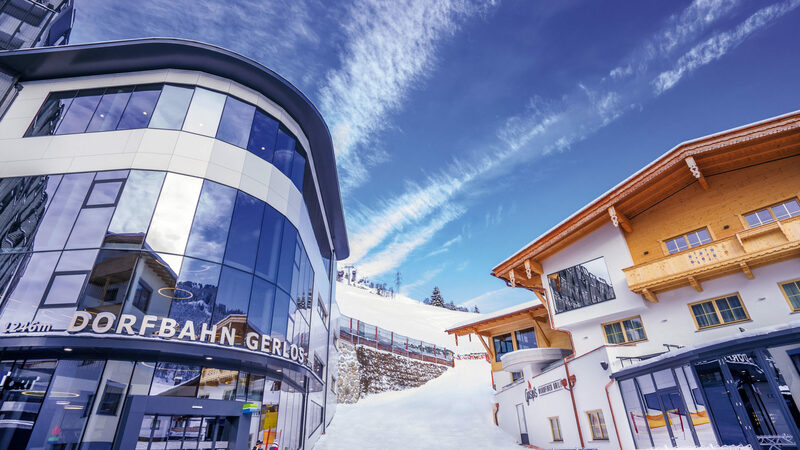 Our hotel in Gerlos in Tirol has a direct underground connection to the new 10-person gondola “Dorfbahn Gerlos” which takes you to the fantastic ski slopes of the Zillertal Arena within just a few minutes. Explore 143 kilometres of well-groomed and snow-sure pistes, cosy on-mountain restaurants and huts, adventurous snow parks and enjoy unforgettable skiing days in the largest ski area of the Zillertal. The 2.6 km gondola ride up to the mountain station “Vorkogel” at an altitude of 2000 metres takes only eight minutes. Our hotel has a direct, exclusive connection to the new gondola lift. Thanks to top modern facilities with ski lockers, escalators and lifts, there is no need to walk a long way wearing heavy boots while carrying skis or a snowboard. After a fun day on the pistes, indulge in culinary delights and moments of fine relaxation. Enjoy the cosy atmosphere and warm hospitality at our hotel and let our culinary team spoil you with delicious 5-course dinners in the evenings. A sumptuous breakfast buffet is the perfect start into the day. Hearty afternoon snacks will be waiting when you return from a day full of winter activities. Our spa and wellness area is perfect to unwind after a day in the Zillertal Arena. Immerse yourself in the refreshing water of our indoor and outdoor pool, relax in our sauna area and treat yourself to fine face and body treatments.